New Delhi: Budget Private Schools (BPS) are critical in improving education quality and access at affordable cost, especially for children from lower and middle income families in India. In the last four decades, BPS have proliferated dramatically in lndia with parents increasingly choosing to pay for quality education. The sheer scale of this sector demonstrates the palpable change in the education climate of India. lt’s imperative to engage with all the stakeholders to bring attention to this credible, evidence-based alternative and work towards ensuring the dream of universal, high quality education for all. Centre for Civil Society spearheads an annual research and evidence-driven publication and dialogue on the role and contributions of BPS within the unaided private school sector in India. The initiative aims to update and push forward the discourse on BPS in India. by providing a platform for informed and inclusive interactions on the sector. Called “Faces of Budget Private Schools,” the BPS report 2018 is an attempt to explore both the data on the current education challenges and needs and also bring to light individual stories from the stakeholders in the system to set the data in perspective. The report features insights from 50 interviews with stakeholders from states such as Delhi, Bengaluru, Punjab, Haryana, Chennai, Coimbatore, Odisha. Telangana, Ahmedabad, Nagaland, Assam, and Kerala. The interviewees include individuals such as principals, parents and students, as well as, with the broader ecosystem of edupreneurs, investors. and foundations that work actively in the space. Through its three sections, the report breaks down the reach and diversity of BPS schools. Showcasing emerging BPS models of excellence, the report highlights how micro-innovations in schools need a larger collective voice. While underlining the existing benchmark performance data, the report brings to light the innovations and suggestions to improve quality through a change in outlook on curriculum, teacher competence, assessment, and school transformation. The report also opens up the dialogue on looking beyond the curriculum and focus on areas like health and creative growth. The section 3 of the report explicates the current financing gaps, fee regulation scenario and innovative financing along with ecosystem development methods that can help drive solutions at scale. Each section concludes with a blueprint for change that suggests reform ideas to advance access, equity and quality of education. To amplify the voices of the key stakeholders in the BPS ecosystem and to understand the feasibility and desirability of affecting the system within education, a panel discussion with the stakeholders will be conducted to mark the launch of the 2nd edition of the Annual Report on Budget Private Schools in India to further the funder, edupreneur and policy discourse in BPS. The discussion was held at Jacaranda Hall, India Habitat Centre, Lodhi Road, Near Airforce Bal Bharati School, New Delhi. 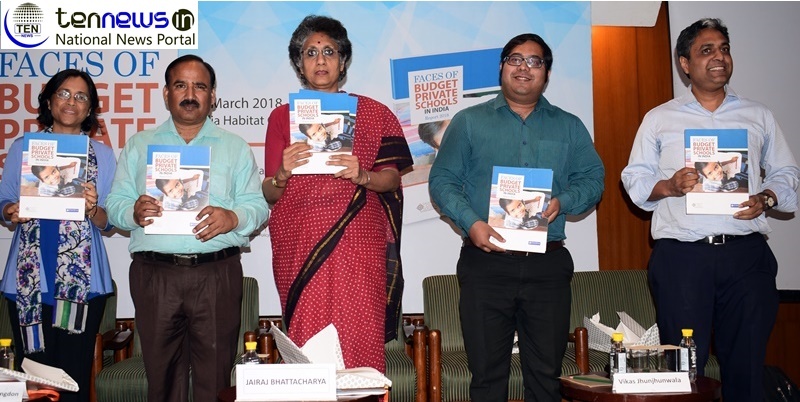 “Faces of Budget Private Schools in India Report 2018” was launched Prof. Geeta Kingdon, Kulbhushan Sharma, , Jairaj Bhattacharya and Vikas Jhunjunwala.